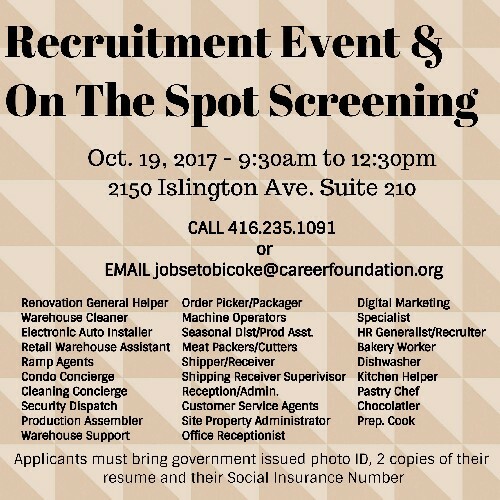 Recruitment Event with On-the-Spot Screening: Various Positions! The Career Foundation is hosting a Recruitment Event on behalf of several hiring employers for full-time and part-time vacancies in Concord, Etobicoke, Weston, Mississauga, Vaughan and Toronto! Join us at 2150 Islington Ave., Suite 210, in Etobicoke from 9:30 a.m. to 12:30 p.m. for on-the-spot screening and interviews! *Please bring with you government-issued photo I.D., 2 copies of your résumé and SIN.